The tools in this set of authentic Italian-made rasps, made from Italian carbon steel, have been hand-forged by Master Craftsmen where each tooth has been meticulously cut and set by hand. Ranging in approximate length from 8” to 11.75”, these rasps are ideal when creating small to medium-size pieces in stone - especially soapstone and alabaster - as well as in wood. 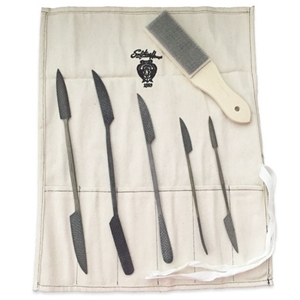 Our set includes a variety of 5 Italian rasps and 1 rasp brush, a must-have to keep rasp teeth sharp and clean for maximum cutting results. All tools are enclosed in a canvas roll for ease of carrying as well as protecting the rasps when not in use. Lemon Green Soapstone - 6 lbs.